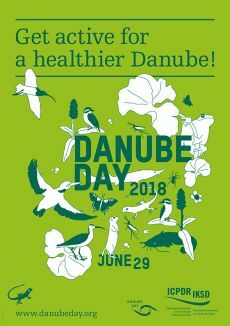 Get active for a healthier Danube at events across northern Bulgaria! Festivities took place in all 7 Danube provinces in 2018, motivating 2,500 people to cycle, cook, fish, get creative and clear rubbish for the Danube. Each local celebration had its own flavour. In Belene, the annual Danube Festival featured culinary delights, quizzes, music and fishing contests; and WWF enlisted local people to take action for sturgeon conservation. In Rousse, 200 musicians and singers paid tribute to the Danube with a special performance at the State Opera House. They performed Danube-themed pieces in the Europe - It's Us concert that also marked the completion of Bulgaria's EU Council Presidency. In Sofia, experts discussed climate change and trends in water resources at a Danube Day conference at the House of Science and Technology. Topics under discussion included the basin-wide impact of climate change; hydrological analysis of rivers; and current trends in monitoring and water management. The event was organised by the Scientific and Technical Union of Water, Federation of Scientific and Technical Unions and Global Water Partnership Bulgaria, with support from the Danube River Basin Directorate – Pleven. In Vidin and Svishtov, the Let's Clean Up the Danube Together campaign was launched, part of a global initiative by the Waste Free Oceans Foundation. Vidin combined this action with a colourful boat regatta, concerts, competitions and art exhibitions. Lom residents also got active with a community clean-up of the riverbanks. Baykal in Dolna Mitropolia held its annual festival of traditional customs, promoting Danube solidarity and basin-wide cooperation. Nikopol's day featured environmental activities and exhibitions. While in Kozloduy, their fabulous Fish Festival was not to be missed! To see how all the countries celebrated in 2018, go to Review 2018. You can also revisit 15 years of Bulgaria's Danube Day via the general Review page. Vesela Komarevska or Ivan Kalamerov of the Danube River Basin Directorate in Pleven on +359 64 885 100; dunavbd@bddr.org. See the programme of events on the Ministry of Environment and Water website. For Danube Art Master, view the Bulgarian factsheet or contact Galia Bardarska of GWP Bulgaria on +359 2 987 04 61; mobile: +359 887 602 672; bardarska@dir.bg.